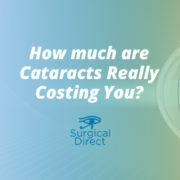 You are here: Home / Blog / Cataract Outsourcing / Why upgrade from Alcon Infiniti to Alcon Centurion? Why upgrade from Alcon Infiniti to Alcon Centurion? In 2013, Alcon introduced the Centurion Vision System to the North American Market. Alcon for decades has been an industry leader in cataract surgical technology, leading the charge in innovative surgical platforms such as the Legacy, Infiniti, and now the Centurion. With decades of experience in cataract surgery at Surgical Direct, we have never seen a machine that has offered so many practical and technological benefits as does the Centurion. Before we go further, we just want to make clear that we believe that the Phaco platform of choice in your facility is ultimately a decision in the hands of your surgeon. We offer all current Phaco platforms available today to our customers, based on their preference. However, we believe that if you are still using the Alcon Infiniti for your cataract procedures, that there are great benefits available to you in upgrading from Alcon Infiniti to Alcon Centurion. So, Why should you upgrade from Alcon Infiniti to Alcon Centurion? Let’s look at some of the main differentiating advantages between the Alcon Infiniti and Alcon Centurion. Infiniti – The Alcon Infiniti uses a custom fluidics software that is powered by gravity flow. This means that the BSS bottle is placed on the automatically adjusted IV Pole, and is raised or lowered to accommodate the surgeon’s preferences in each step of the procedure. The bottle height determines the depth of the chamber within the eye, and each step in the procedure typically has slightly different parameters. Gravity-based fluidics has been a standard in Phaco technology for decades and still has certain benefits. The only downfall to a gravity-based fluidic system is that the chamber will tend to fluctuate each time the surgeon steps on or off the pedal. This can create sudden increases/decreases in pressure inside the eye. Additionally, a gravity-based fluidic system has little control over a post-occlusion surge from occurring. Centurion – The Alcon Centurion introduced a ground-breaking technology in cataract surgery called “Active Fluidics TM”. The main difference between “active” and gravity (although there are many), is that Active Fluidics uses sensor-directed plates that squeeze the bag of BSS in a controlled environment. These plates are hyper-sensitive (down to single-digit mmHg readings of pressure in the eye) and are automated based on the pressure reading inside the eye using pressure sensors. In short, Centurion actually controls the pressure in the eye dynamically, keeping a constant state of pressure based on the inputted settings. This virtually eliminates the chance of a post-occlusion surge, because the plates adjust according to the pressure reading, making Active Fluidics the safest fluidic platform available today. In our experience, each surgeon that has used Centurion will rave about the chamber being stable and “quiet”. In turn, this allows the surgeon to be more at ease during his cases, not worrying about a surge in intraocular pressure. Relaxed Surgeon = Better Outcomes! Infiniti – The Alcon Infiniti introduced the “Ozil” Torsional power to the phaco market. This brought a different ultrasonic motion to the Phaco tip that reduced overall energy displaced in the eye significantly compared to previous Phaco technologies. With the power of traditional phaco power combined with Alcon’s new “Ozil” power, total energy levels per case were reduced. Lower energy output in the eye during surgery, the better. Centurion – With the release of the Alcon Centurion, came the release of the “Balanced Tip”. The balanced tip (only available for use with the Centurion) harnesses the Torsional power of the tip in a different way, dispersing the energy in a more efficient way. What does this mean? This means that the energy used in each case is more effective. Even at lowered power outputs, the “Balanced Tip” can cut more efficiently, reducing overall power outputs into eye significantly on each case. This makes for a happy surgeon because lower energy output typically means better vision outcomes for their patients. Infiniti – The Infiniti has first released in the early 2000s in the North American Market. With a number of software updates since its first release, Infiniti has continued to be supported and improved upon by Alcon until 2013 when the Centurion was released. What this means is that no updates or improvements have been made to the Infiniti software for the last 5+ years. Infiniti machines will start to have a higher risk of break down and malfunction simply due to older parts. Plus, Alcon has made an obvious manufacturing shift due to their new technology offering, and fewer replacement parts for Infiniti are being manufactured. If you still have an Infiniti in your facility, just by simple math, it’s only a matter of time before a decision will have to be made to upgrade. Centurion – The Alcon Centurion comes with many practical features that make upgrading from Alcon Infiniti to Alcon Centurion an easy choice. Aside from what we’ve mentioned already from a surgical aspect, there are quite a few other practical upgrades to this platform. A)Wireless FootPedal. This seems like it wouldn’t be that big of a deal, but to the surgeon and room staff, the wireless foot pedal is actually a very nice upgrade. Alternating from left eyes to right eyes is easier. Room turnover (rolling beds in and out) no longer have to worry about chords. It’s a small thing, but in our experience, is a nice feature. B) Handpieces. When you upgrade to Centurion, you no longer have to buy all new handpieces. Even though Alcon introduced a new handpiece with this system, you are not tied to using them. You are able to use any of the old “Ozil” handpieces with Centurion and still enjoy all the new fluidic and energy features. Why is this important? 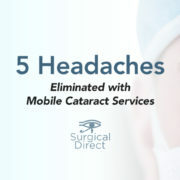 With the ever-changing sterilization requirements from joint commission (or other governing medical bodies), having a shortage of handpieces can make a heavy cataract day difficult. We think it’s a very nice feature. C) AutoSert IOL. With Centurion comes the opportunity to use Alcon’s “AutoSert IOL Delivery System”. This is a motor-driven IOL injector that hooks into the Centurion, allowing for single-handle injection of the IOL at predetermined insertion speeds. A very nice feature that brings more stability to this vital step of the cataract procedure. More info on Alcon Centurion and its features. There are many more amazing features that Centurion has to offer. Perhaps you were already well aware of the benefits of using Centurion, but your facility doesn’t have the capital funds to purchase Centurion. Or maybe you have multiple surgeons operating in your facility, and one wants Centurion, and the other does not. Surgical Direct exists to serve. With our unique Mobile Cataract Outsourcing model, we are able to help you upgrade from Alcon Infiniti to Alcon Centurion with NO upfront capital investment. On top of that, our well-trained and professional surgical coordinators know all the ins-and-outs of Centurion and will help your staff acclimate to the change in platform. We make it easy. Are you thinking about upgrading from Alcon Infiniti to Alcon Centurion? Leave us a comment and let us know your reservations. We are confident that we can help make it possible in your facility. Want more info about Surgical Direct? Click HERE for info pertaining to Hospitals. Click HERE for info pertaining to ASCs. Click HERE for info pertaining to Ophthalmologists. Great reasons for upgrading INFINITI to Centurion(R). In my years with Alcon I loved the way we used to upgrade phaco systems brining new technology to surgeons enhancing their surgical efficiency, improving outcomes and better safety. I just wanted to draw your attention on what maybe a typo in the article here, should it “AutoSert instead of AutoCert” ??? Thanks for your comment, Jimmy. You are correct! We are not sure how that got passed us. Thank you for pointing it out, and we’ve made that correction. All the best. Agree with everything you said but I do have a question. Why is the Balanced Tip not avaialable for use on the Infiniti Vision System? You duly pointed out that you can use the same phaco handpiece on the Infiniti and Centurion. So the balanced tip clearly can be used with the Infiniti handpiece. I wonder why you can only use the Balanced Tip on the Centurion? Thanks for your question. The Balanced tip is compatible with the Infiniti Handpiece, but the technology on board the Centurion is what creates the “magic”. From our understanding, it’s tied to the algorithms built into the Centurion software that create the enhanced cutting experience. A great reason to upgrade!